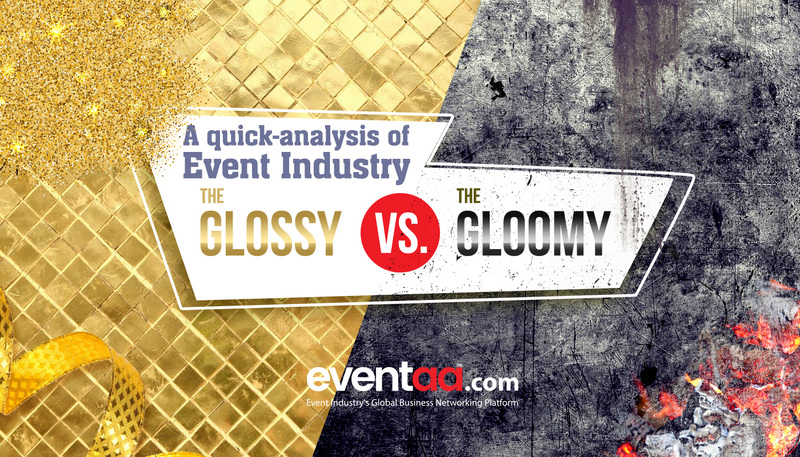 Event industry has two different sides, one that is colourful, rich and glittery while the other that is stressful, daunting and cumbersome. Both sides are inevitable and have advantages and disadvantages. Considering the above fact, the red carpet for any event industry aspirant can come cosy but only when they are prepared to take the hidden boulders underneath. The path that every successful event planner walks to bring glory to their work. Let see the glossy and gloomy sides of the event industry. The event industry is one such industry where you can give wings to your imagination. There is no limit to incorporate your creativity into one particular segment. The spectrum of the field is quite wide, and any creative ideas can take shape into event décor, interactive booth stall, special acts, theme-party, and so on. For travellers, it’s a dream job. They fly through various cities and sometimes countries for events, weddings, exhibitions. On top of that, they meet people with various ethnicity and cultural background that helps them to bring diversity in their work. Destination weddings and theme-based party and events summons beautiful venues and luxurious hotels. Event planners take flying-visit to various hotels helping the client in deciding venues for events. It becomes more a leisure activity than a menial job to sneak into some best piece of architect and enjoy their complimentary services. It’s like an icing on a Cake. The industry pays hefty packages. There is no bar in earnings as such the industry always ready to pay good packages to talented folks. The exponential growth is observed decade after decade, and it’s only going to add more to the perks. A bright career usually demands professional degrees and certificates, noticeably a barrier for prospects who are talented but can’t make it due to circumstantial void in academics. This is not the case with Event Industry, you just have to showcase your work to build a successful career. Every event project is different from other, so one will find a lot of varieties in their day to day work. The scope of work depends on the type of projects. Unlike, other industry you will not face the boredom of doing the same task over and again. The event industry is vast and flexible. It gives vendors and employees the freedom to work as freelancer or switch between full-time employment or contract assignments. If you connected to the right platform, getting freelance work in event industry shouldn’t be an issue. Imagine if the event organization process is represented in a graph, then you would probably see a zigzag pattern you have ever come across. Every event planner works and grows with this fact. They arrange every distorted piece into one single structure to make the event a great success. The process sometimes stretches to the last moment of the event. Event Planners always remain under pressure to implement innovative ideas. It is only this field that demands continuous design ideations and innovations to meet client expectations. It is more fun than an obstacle, however, on certain occasions, you have to break the creative bar and do something exceptional or better known as Jugaadu tactics. Client satisfaction is a priority for event planners, but it is quite challenging to understand the needs of client. For example, in a wedding event, one client likes grand and gaudy decor, while other prefers simplicity. This sometimes becomes challenging for the event planners. So, event planner should be good at hacking client’s psychology. There are various government authorities involved for event permissions, venue allocation, power supplies, and other legal laws. Running down to officials and gathering all documents sometimes get even more hectic than actually organizing the event itself. Event planners are the rooster of the Event Farm; they have to graze on every opportunity. They have to frequently travel to seal a business deal, connecting with the field experts, build stronger bonds with clients, and so on. As an event planner, you are expected to remain ready with your bag-pack, you never know what next flight you have to board. Despite all the precautions you cannot keep a watch on everything. Things lapse during events and reason could be multiple – bad weather, unexpected incidents, short supplies, conflicting schedules, etc. All these factors are pre-considered by the event planners with the proper backup plan. But even in the most certain conditions uncertainties looms bearing huge losses. Gaining recognition in the event industry is difficult on an individual basis as well as a business proprietor. It is a setback for event industry that till date no efforts are made to highlight event people’s hard work or skills. But not anymore, to address this brewing concern networking platform like Eventaa has worked out the solution. It has built a platform that works like a connecting dot for event fraternity which brings event people closer and introduces their work/skills/business on a larger scale locally and globally. Event Industry is a multi-oriented field. You will see all kind of people involved in a single event viz. decorator, staging crews, artist, etc. In such scenario, event planner needs to coordinate at all levels as a part of its operational strategy and have to gauge things beyond usual perception. At the time of events/weddings/etc. Event industry people have to work day and night to complete the work in the decided timeline. No matter how much pre-planning one has done, last minute issues always happen. Sometimes these issues are so critical that if they are unresolved immediately, it can create chaos. 1. Analysis and find out before an event where the changes are more likely to occur. Make sure you have a backup plan to counteract the problem if it happens. 2. If you are taking bouts all alone, then try to sort out few software tools that can lessen your burden of managing and recording an event. 4. Keep yourself updated with government policies and regulations for events by registering for the forum or social media group. 5. Connect with the networking sites that makes “hiring” and “getting hired” process seamless. 6. Keep your refund policies simple to avoid conflict like- validity date for a refund, any charge incurred for a refund, refund carry-forward to next event etc. 7. Ask peers or brainstorm with your business group for developing new ideas or finding a solution for any problem. Probably your perspective on event industry may be same as above, but the ways of tackling them could be different, or you might have the ability to counteract the situation in a better way. Don’t hesitate to express your views in below comment section.